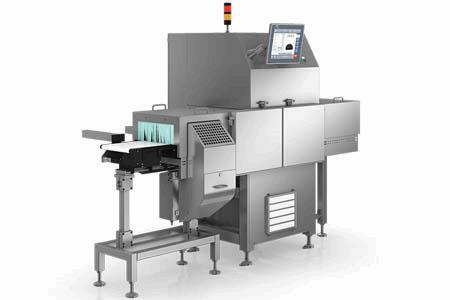 The SC-W series is a pioneering combination of innovative X-ray technology and the proven checkweigher technology from OCS for the food manufacturing industry. The products in the accepted goods stream are checked not only for impurities, but also undergo a high-precision weight control check. Units with an incorrect weight are ejected into a separate container. Both the single and the dual-track model are very successful – either with or without the curtain for radiation protection. The variant without protective curtain provides high throughput rates of up to 300 pieces per minute per track, which is even possible for very lightweight product units.